Having decided on a new electoral system to replace our outdated electoral college system with one-member-one-vote (OMOV), the Welsh Labour Party is about to seek nominations for a new leader of the Labour party in Wales and Labour’s nomination for First Minister. Ballot papers will be sent out later in the year and the results announced on December 9th. Before Christmas we will have a new leader and First Minister in Wales. With a Conservative/DUP government in Westminster, an SNP government in Scotland and no government in Northern Ireland, Wales is the only administration with a Labour leader. The choice made by Welsh members and affiliates is important for the future of the Labour Party, not just in Wales but across the UK. Successes in Wales will be highlighted by Labour nationally but any failures will be pounced on by our political opponents. What we need to look for in our new leader in Wales is someone who can show vision and enthuse Labour supporters to vote at the 2021 National Assembly elections. Labour election victories are not inevitable, and they are achieved not just through hard work on the ground but also through our ability to convince the electorate that Labour is the party looking after their interests. The case for anybody to be the leader of a party is a combination of the personal and the political: a willingness to do what is right even if it’s not popular, to listen to and work with others, and (most importantly) the ability to identify the key issues and address them. Our country faces unprecedented challenges. The deepest and most unremitting period of austerity in nearly two centuries is set to continue, although austerity is the political choice of Westminster Conservatives, not an economic policy. Leaving the EU will leave Wales and the UK poorer, with our influence in the world diminished and our security less certain. Wales, as a net recipient of European funding, will need to fight to ensure that we do not lose out financially. We need a Labour leader who is determined to revive and reapply a set of fundamental and enduring democratic socialist principles to confront these challenges. We need to both govern and campaign as a democratic socialist party. The ‘sink or swim’ society holds little attraction – even among many of those lucky enough to be swimming, who realise they are just a few bits of misfortune away from sinking. Rather than exacerbate the inequalities encountered by so many at birth, it is the responsibility of government to reverse them wherever possible through risk-sharing and redistribution. In far too many of our poorest communities, health is generally poor, made worse by poor diet and lack of exercise. This toxic mix is combined with educational underachievement and minimum wage employment with few or zero hours guaranteed. This cannot be resolved overnight but our new First Minister will need to be committed to working towards better health, education and jobs across Wales. Councils have started building houses again, but we need a First Minister who understands the crucial role of social housing. That’s the only way to tackle the insecurity faced by too many people in Wales who are living in short term lets in privately rented properties, some of very poor standard. For the Tories, “taxpayers’ money” is there to maximise the profits of those to whom the assets and services created by the public have been handed over. We need a First Minister who will ensure that taxpayers’ money is used to maximise the benefits for everyone by retaining the assets and the services for which the public have paid in public ownership. We need a First Minister committed to improving the environment, dealing with illegal levels of air pollution in many urban areas by investing in much better public transport across Wales. The Labour Party in Wales has the great good fortune of many thousands of new members joining our ranks since 2015. I remain a supporter of this basic principle: major decisions in our party should be taken on the basis of each elector having one vote of equal value. 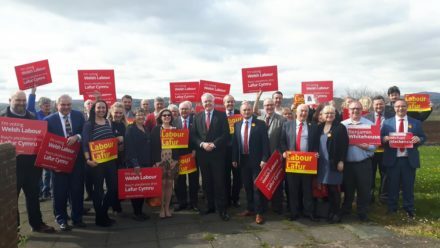 The next Welsh Labour leader needs the authority that comes from having the support of a majority of that membership — just as those members need to know it is their voice that is decisive in the major decisions we make as a party. Nothing else will do. I am supporting Mark Drakeford for leader because I know he has the personal strengths as well as the political experience and commitment needed to lead a successful Welsh government and win the next election for Labour. Mike Hedges is AM for Swansea East.